Watford are my team, I watch them week in and week out, so it pains me to see them being so bad defensively from set-pieces this season. 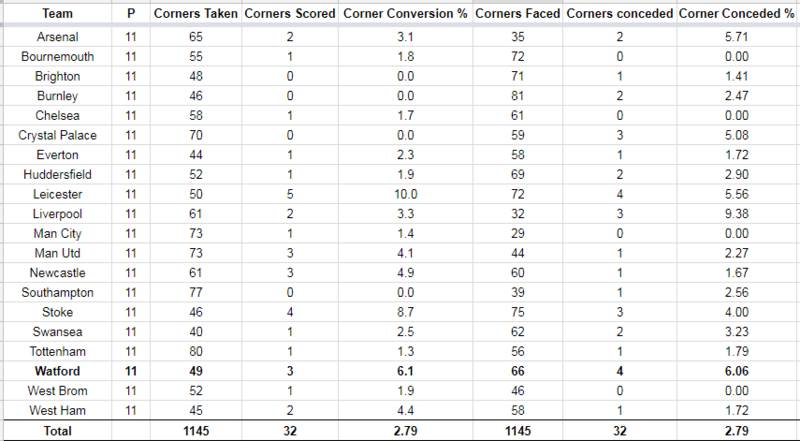 So many in fact that they have the 2nd worst corner conceded ratio in the Premier League as you can see below. So I’m going to examine how Watford set-up defensively from corners (using some recent examples), what they react when the corner is taken and how they could possibly improve. Watford start off with all 11 players back in the box. Kiko Femenia (#21) and Andre Carrillo (#28) are sent out to watch for any potential short corner. Troy Deeney (#9) and Abdoulaye Doucoure (#16) are given the duty of zonally marking the near post. A quartet of Richarlison (#11), Christian Kabasele (#27), Adrian Mariappa (#6) and Jose Holebas (#25) zonally mark the danger area right on the edge of the 6-yard box whilst Tom Cleverley (#8) and Etienne Capoue (#29) man mark Salomon Rondon and Craig Dawson – presumably identified as West Brom’s biggest aerial threats. Pretty similar set-up to the West Brom corner, except the line of players on the edge of the 6-yard box is now 6 players long, with Doucoure (#16) dropping slightly deeper to mark the near-post area. Femenia (#21) and Andre Gray (#18) are deployed to watch the short whilst Cleverley (#8) is assigned to Per Mertesacker and Roberto Pereyra (#37) is floating around not really marking anyone. The ball is whipped in, and the Arsenal players by the penalty spot all begin their run, with Mertesacker powering home the header from 6 yards out. A bit of an anomaly this one and isn’t included in my corner stats due to being scored more than 5 seconds after the initial corner. The short corner catches pretty much every Watford player unawares and is played before everyone’s in position, Eden Hazard plays the ball to Pedro who curls a fantastic shot home from outside the box. Capoue (#29) and Carrillo (#28) are assigned to man-mark, whilst 5 players line up on the edge of the 6-yard box, with Deeney (#9) drops a little bit deeper. The corner is played in first time for Darren Fletcher to strike home from the edge of the box. A fantastic strike, but highlights a potential weak spot within the Watford defensive set-up. Again the line on the 6-yard box is deployed, with 2 players (Cleverley and Carrillo) the ball is floated in and Dominic Calvert-Lewin heads home at the back-post. Watford are lucky to have only conceded the above 6 goals as teams have repeatedly been able to create decent chances, some of which are shown below. Similar to all the other set-ups, a line of players zonally marking the 6-yard box, 2 across for the short and 2 man-marking. The cross comes in and a Liverpool head meets it, crashing the ball against the crossbar. Typical Watford formation of one player (since Watford were down to ten men), with a line of players zonally marking the edge of the 6-yard box. The ball is whipped into the 6-yard box and a Brighton player gets their head to it, but the connection isn’t clean and the ball goes out for a goal-kick. The defensive line on the 6-yard box is again utilised, but with 4 players, with Capoue (#29) and Doucoure (#16) guarding the near post area. Gray (#18) and Femenia (#21) are sent across for the short whilst Cleverley (#8) and Carrillo (#28) are again deployed to man-mark. The ball is whipped into the 6-yard box, a Swansea player (I think Wilfried Bony) gets a touch and Federico Fernandez missed out on prodding the ball home at the far post. If I were an opposition analyst, I’d look at Watford’s defensive setup and class them as highly vulnerable, with the same defensive lay-out for each team with weaknesses in 2 key areas. Below is a diagram of a usual Watford defensive set-up, with 2 players across for the short corner, 2 players man-marking the opponents biggest aerial threats and the rest of the players in the 6-yard box – one on the near post and the rest on the 6-yard line. The box marked 1 is where I’d try to exploit first. Zonal marking has one large weakness – static players. Players attacking the ball from deep have momentum on their side, giving them an instant advantage against the static nature of zonal marking. Having half your outfield players in a straight line in this set-up is just asking for players to attack the ball in this location, which would most likely lead to a fair amount of chances being conceded in a crucial and dangerous area. So I can sort of understand why Watford don’t focus on defending this area as much as the 6-yard box, but as shown so far this season – there’s definitely plenty of players able to pull it off. The player guarding the short corner would be tight to the player sent across to possibly receive the short – this would either drag another opposing player out of the box and across for the short or force them to put the ball into the box – both good things! The single wall of 5-6 players spread across a straight line gets cut down to a wall of 4 players, spaced apart along the 6-yard box with one guarding the near post area. A few yards in front of those 4 players are another line of 3 players – plugging the gaps between the wall closest to goal. This will have the effect of slowing down or stopping runners from attacking those gaps between the defence. This sacrifices the players that were previously man-marking, but it is possible for these players to execute a half zonal, half man-marking system (dependant on what the opposition player does of course) where the player doesn’t entirely leave his zone, but still tracks his designated players run if the run is going to be a predictable attacking run attacking the 6-yard box. Such a system is utilised by Ostersunds, who have conceded just once from 127 corners so far this season – keep your eye on the players just in front of the 6-yard box. Finally, we put a man near to the edge of the D, this cuts out any potential long-shots and providing the team has the right personnel (which in Watford’s case would either be Gray or Carrillo) could prove to be a good counter-attacking opportunity. This should ensure defensive stability, the only concern is if the opponent did bring another player across for the short (creating a 3 vs 1 scenario). The options here are for one of the players to come across to cover (most likely the player on the near post) or just to chance it and keep the stable core in the middle of the box and hope that holds up. Watford had a flying start to the season, so it’ll be disappointing to see it collapse due to something like the inability to defend set-pieces, so for my sake and for Watford’s – let’s hope they sort it out soon!